Acne is a skin condition which consists of clogged pores (blackheads and whiteheads), inflamed pimples (pustules), and deeper lumps (nodules). It occurs on the face, as well as the neck, chest, back, shoulders, and upper arms. Although most teenagers get some form of acne, adults in their 20’s, 30’s, 40’s, or even older can develop acne. Often acne clears up after several years, even without treatment. However, acne can be disfiguring and upsetting to the patient. 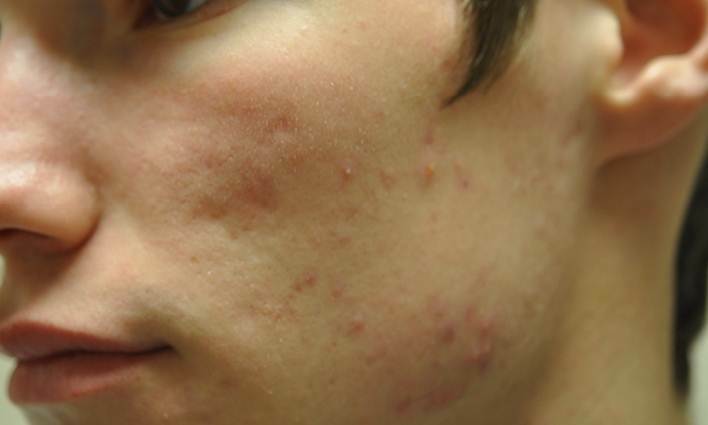 Untreated acne can leave permanent scars; these may be treated by your dermatologist in the future. To avoid acne scarring, treating acne is important. Adult acne develops later in life and may be related to hormones, pregnancy, menopause, or discontinuation of oral contraceptives. Adult women may be treated at the time of their period and at ovulation when acne is especially severe, or throughout the entire cycle. Controlling acne is an ongoing process. All acne treatments work by preventing new acne breakouts. Existing blemishes must heal on their own, and therefore, improvement takes time. If your acne has not improved within two to three months, your treatment may need to be changed. The treatment your dermatologist recommends will vary according to the type of acne. Your dermatologist may prescribe topical creams, gels, or lotions with vitamin A acid-like drugs, benzoyl peroxide, or antibiotics to help unclog the pores and reduce bacteria. These products may cause some drying and peeling. Your dermatologist will advise you about correct usage and how to handle side effects. Before starting any medication, even topical medications, inform your doctor if you are pregnant or nursing, or if you are trying to get pregnant. Acne surgery may be used by your dermatologist to remove blackheads and whiteheads. Do not pick, scratch, pop, or squeeze pimples yourself. When the pimples are squeezed, more redness, swelling, inflammation, and scarring may result. Microdermabrasion may be used to remove the upper layers of the skin improving irregularities in the surface, contour, and generating new skin. Light chemical peels with salicylic acid or glycolic acid help to unclog the pores, open the blackheads and whiteheads, and stimulate new skin growth. Injections of corticosteroids may be used for treating large red bumps (nodules). This may help them go away quickly.